Lisa Oliver brings over 30 years of financial services experience to her role as President and CEO of The Cooperative Bank of Cape Cod. The 5th President in the Bank’s 98-year history, she’s the first woman to assume the role. 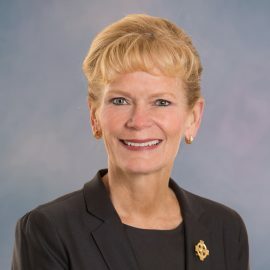 Prior to leading The Coop, she spent 25 years at Cleveland, Ohio-based KeyBank where she rose quickly and assumed several senior leadership roles. Before relocating back to the Northeast, she was the Executive Vice President and Head of Business Banking, leading the company’s $3 billion business banking unit. Early in her career, she led business banking teams across Maine, Vermont, New Hampshire, and New York as the Northeast Sales Executive and Segment Leader. After moving to Cleveland, Oliver served as the President of the Greater Cleveland District for 13 years, guiding the Bank’s 85 branch locations, as well as the commercial, business, and private banking sales teams to success. Throughout her time at KeyBank, Oliver led the bank’s extensive philanthropic initiatives and remains a passionate advocate for volunteerism. She is deeply entrenched in the Cape’s philanthropic community. Among her notable accomplishments since joining The Coop was the establishment of The Cooperative Bank of Cape Cod Foundation Trust in 2018. “The Coop Foundation” will significantly expand the bank’s philanthropic reach, awarding grants to 501(c)(3) organizations that meet the fundamental needs and challenges of people in the communities the bank serves. Oliver is also a board member of The Cape Cod Foundation and Cape Cod Chamber of Commerce; an Ambassador for the YMCA of Cape Cod; and a Member of Women United, an affinity group of the Cape & Islands United Way. She frequently speaks to business and civic organizations and was a guest presenter at the 2018 BAI Banking Conference, speaking on the topic of “High Touch Coaching in a Digital World.” She was equally involved in Ohio’s philanthropic community during her two decades at KeyBank. She served in numerous leadership capacities with organizations including the Rock and Roll Hall of Fame, United Way, American Heart Association, Gilmour, and Cleveland Botanical Garden. She was also Co-Executive Chair of the Young Professionals Key Business Networking Group and was honored by the YWCA Greater Cleveland as a Woman of Achievement Recipient. A graduate of Colgate University where she studied International Relations and French, Lisa went on to complete an Executive Leadership Program at Case Western Reserve University. She was raised in Kingston, New York and spent many years in the Northeast prior to moving to Ohio to join KeyBank. No stranger to Cape Cod, she spent the last 20 years vacationing on the Outer Cape. Her love of our beautiful and close-knit community was a driving force in her desire to relocate here as an empty-nester with her husband, a native of Sharon, Massachusetts, and two black labs.